Crystal Spring Ranch is located in the Absaroka/Beartooth mountain range. Our cabins are rustic, varying in size and 3 have fully equipped kitchens with shower/toilet facilities. 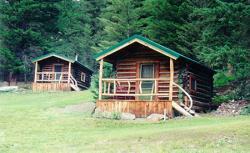 There are two separate sleeping cabins with out kitchens and the use of a separate shower/toilet building. We are in a mountain setting, surrounded by wilderness. Hiking trails are nearby and plenty of river for fishing; we have a mile of river on our property. Great opportunities to view wildlife or a quiet setting to relax. Bring your own food and a good attitude. Weekly rentals preferred. 2 night stay minimum. No pets allowed. Directions: Crystal Spring Ranch is located in south central Montana. Turn off Interstate 90 at Big Timber, which is 80 miles west of Billings and 60 miles east of Bozeman. Travel south on McLeod Street/Route 298. Stay on Main Boulder Road for approximately 37 miles.